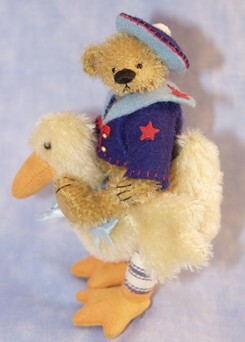 Inspired by her sister, Jane Davies, who is a miniature doll artist, Deb Canham began making bears in the late 1980's. 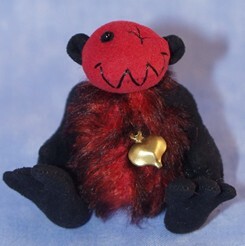 "I worked at my kitchen table making small, limited edition miniature velvet bears and gollies." 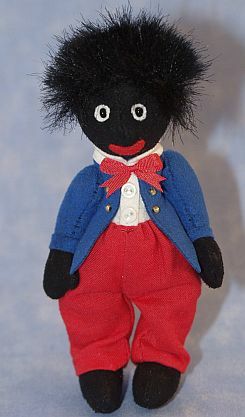 She began selling them at doll house shows and later, bear shows in the UK. "I was lucky enough to travel all around Europe, Japan and the United States, where I taught miniature bear making as well." 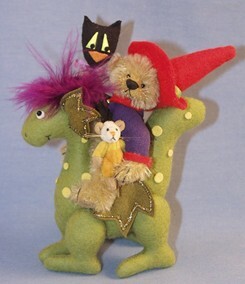 In the early 1990's, she began designing for Jamie Wu and the "Little Gem" company and also designing some larger bears for "Teddy Hermann Original." Deb's transition from artist to manufacturer was a very deliberate decision. "I actually hated making the same bears more than once and really, my greater interest was in marketing miniature bears for the masses." 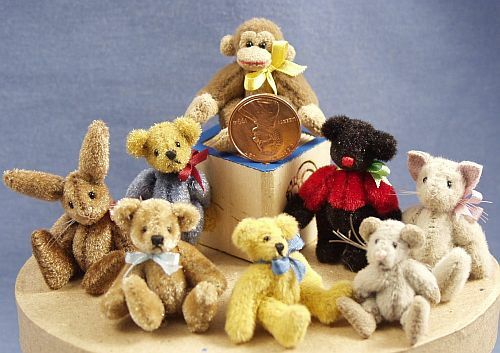 "I believed that if we could only get more miniature bears into the stores at an affordable price, we would grow the miniature bear industry. As much as we divide this industry into artist and manufacturers, they are both inextricably linked. For artists to do well, they have to depend on the manufacturers to pull in new collectors. 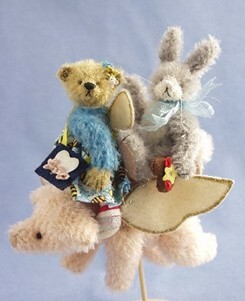 Very few collectors begin with artist bears." In 1996, Deb moved her family from a tiny village just outside of Plymouth, Devon, England to Sarasota, Florida. "A crazy move in many respects," she recalled. "But whilst I feared failure, I actually could not live with myself if I had not given it a go." With her aim to set up her own miniature business and present it as a true collectible, Deb created a line made from German mohair, fully jointed, with a presentation box, tag with the name, and limited edition number. 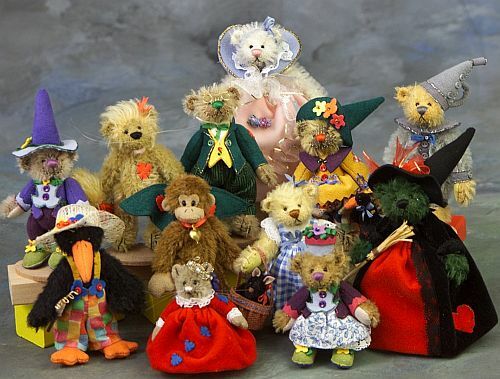 Deb created a 'Collectors Club' and Convention in order to promote bear collecting; it's aim to have fun. Drawing on real life experiences to inspire her work, Deb creates pieces with that in mind. "I think it is really interesting for collectors if they know what the inspiration point is for a piece I have designed. I have lots of stories with lots of my pieces and I think it does matter that collectors know what is going on in my daily life." 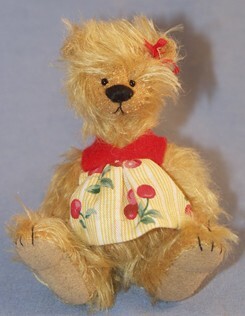 Dressed little bear jist 3.75 tall. 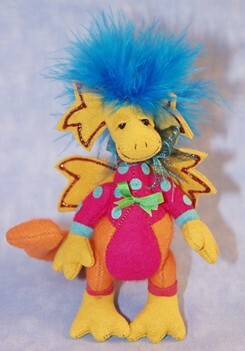 A colorful dragon measure 3.75" tall. 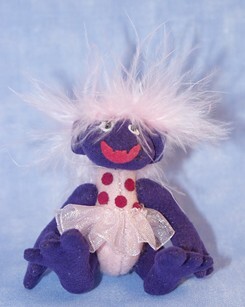 is a cute 3 inches tall. Many of her pieces draw sentimentalities from her family life and her childhood experiences of which she is proud to relate in her creations. As Deb's manufacturing business has grown, she has been working with a small group of women in China who she taught to sew and make her figurines. "There is no factory as each of the women work from their homes. Like many other people, I have my concerns about products made overseas in regards to what goes into them. So everything, from stuffing, threads, needles and fabrics are sourced from the USA, Germany and the UK and sent out to them in China. This ensures that only the best quality materials are used in the production of the products." She is immensely proud of the quality of her products and of the achievements of working with a wonderful group of women from another country. "Over the past fifteen years, we have watched each other's children grow. We have watched them marry and most of us are now grandmothers. I have discovered that women's worries, cares and concerns are much the same over the world and that the more we depend and support each other, the richer our lives become." At the heart of it all, Deb's aim is to just make people feel good. "Recently I spoke with a collector and she was going into the hospital for an operation and had just bought one of my Christmas sets. She said how much it had cheered her up immensely and that in turn, made me feel like a million dollars." "I think people like to treat themselves to something nice to cheer themselves up and I have benefited greatly from that this year. And even though we may look back over the past five years and see this period as 'gloomy', I do believe it is behind us now." With improvements in her sales this year and with a record number of new club members, Deb's looking forward to a very prosperous New Year. 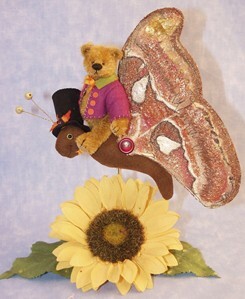 The Bear measures 3.75" tall. scaled for the doll house collector and are 1.4 to 1.5" tall. from the Wizard of Oz. Most measure 3.75" tall or less.